About us here at Aguado Stone with Limestone, sandstone and Lueders quarries. When thinking of mastering the thought of human ability…think of Martin Aguado. A humble man, from truly humble beginnings, Martin launched Aguado Stone Inc. in 1997. At the age of just 21 years old, Martin Aguado, like a Rhinoceros, decided to charge forward and go after the "American Dream". His character and determination has been the road map for Aguado Stone Inc. to be a real success story. Martin started this organization by saving enough money to purchase his first chopper and skid steer. This equipment was humble, as well, being old and used equipment. Mr. Aguado literally started to build his dream with himself and one other employee. Over 20 years later, Martin has mastered the art of duplication. He has duplicated himself by training and educating all his personnel, at all six locations. Now, Aguado Stone Inc. has become one of the largest natural stone providers in Texas and around the nation. 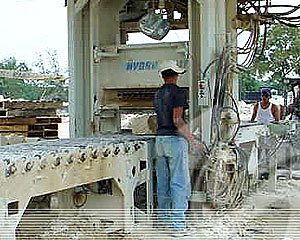 Aguado Stone Inc. appreciates the opportunity to become your stone provider-of-choice. From the Aguado Family to yours, Martin Aguado's "Mission" is to give every client exactly what they want, at a fair price, and in a timely manner…every time! This is his commitment to you…and ask that you make the commitment to Aguado Stone as your supplier!